Cotidie on Marylebone High Street is the first London restaurant for Chef Bruno Barbieri, an Italian chef who most recently held two Michelin stars at the Villa del Quar in Verona, and before that, two stars at Il Trigabolo in Argenta. In total he has laid claim to seven Michelin stars. Furthermore, regular stints as a judge on the Italian Masterchef has ensured that he is one of the most recognisable chefs in Italy. So it came as some surprise to the Italian public that Barbiere would leave Italy and venture out to London. The opening night of Cotidie was reputedly packed with Italian journalists. The word cotidie means ‘everyday’ in Latin. But if such a terminology suggests something casual, rest assured there is nothing casual about Cotidie. The décor is decidedly refined with soft hues and a leather-banquette look. The staff are smartly dressed and the cutlery is very expensive. The menu reads of a man who knows his stuff, and for someone of his pedigree, the pricing was fairly reasonable. 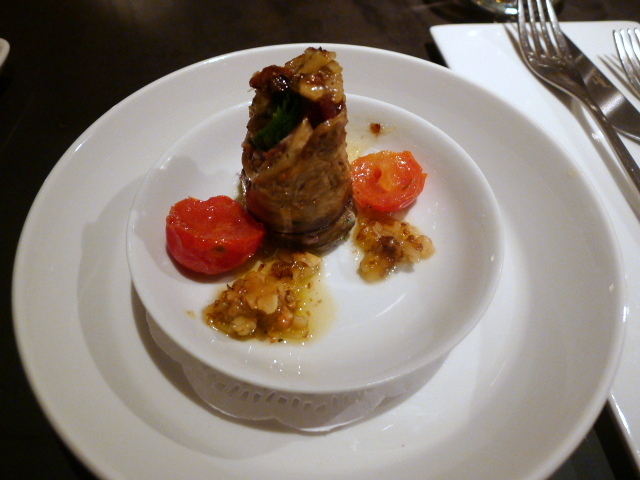 For our amuse bouche, we were presented with an aubergine roll with rocket and Parma ham which was delicious. The aubergine was soft, and the rocket was fresh with bite. There was a hint of parmesan running through the roll, and the garnish of cherry tomatoes was lovely and sweet. 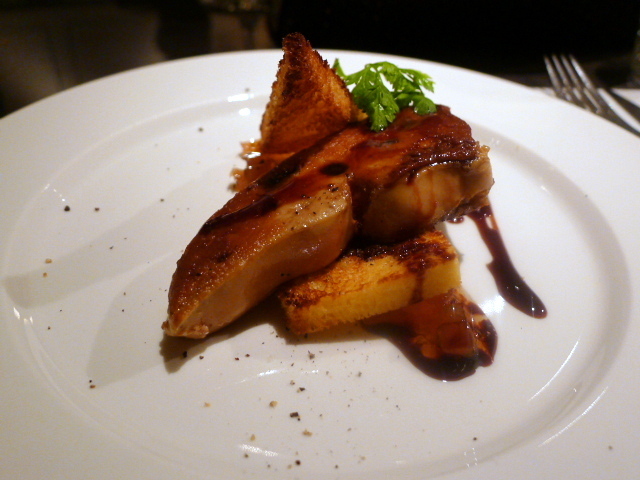 Goose foie gras (£18.00) was beautifully cooked, rich and unctuous. It came with scented lime chutney and toasted pan brioche, both of which were nicely done. The only drawback was that the plate had not been heated so the dish went cold quite quickly. 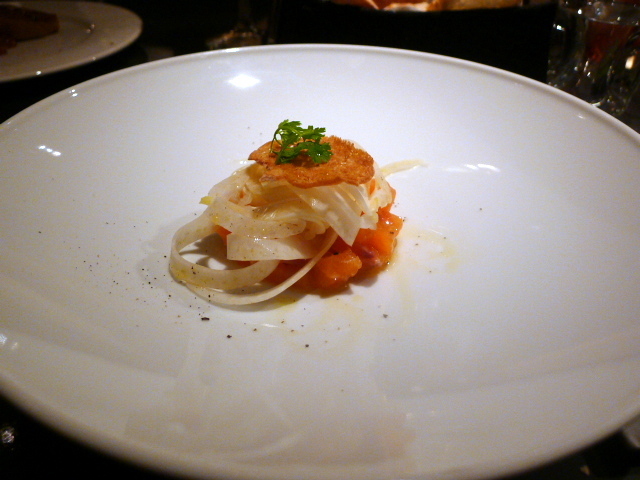 Tartare of marinated wild salmon with fennel and citrus salad (£13.00) was resoundingly light. There was a delectable sweetness to the salmon, and the fennel was crunchy and fresh. The best fregola I have ever tasted is the version by Francesco Mazzei at L’Amina (which I also tried when he was at St Alban on Regent Street). 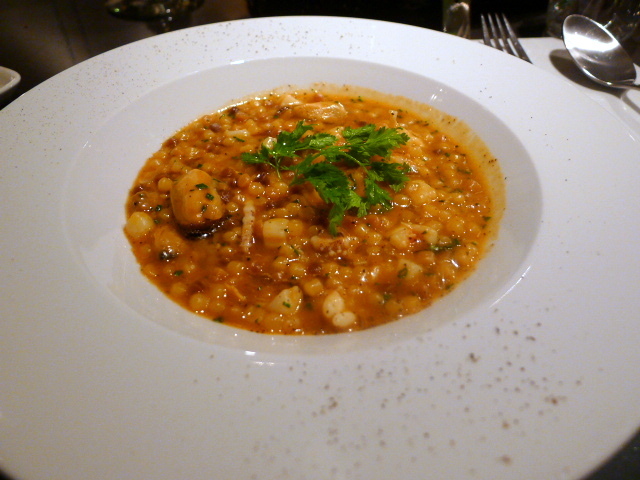 Here, the Sardinian fregola with saffron infusion, olive oil and basil (£16.00) was also scrumptious. It was rich with flavour and sweet from the taste of the prawns, scallops, mussels and clams permeating through the broth. 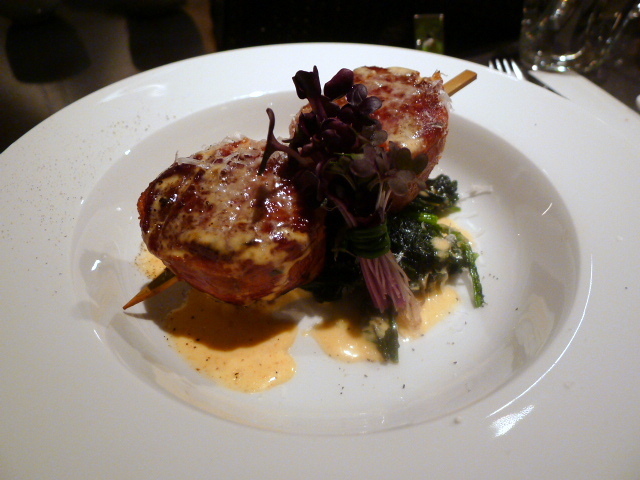 Roast medallions of lamb wrapped in Parma ham (£26.00) thrilled with its excellence. Perfectly cooked, tender and tasty, the subtleness of the Taleggio fondue made a good match for the lamb. Braised cavolo nero rounded off the dish. A side of creamed potatoes was wonderfully tasty. Grilled scallops (£21.00), cooked to an opaque colour, impressed with their succulent meatiness. 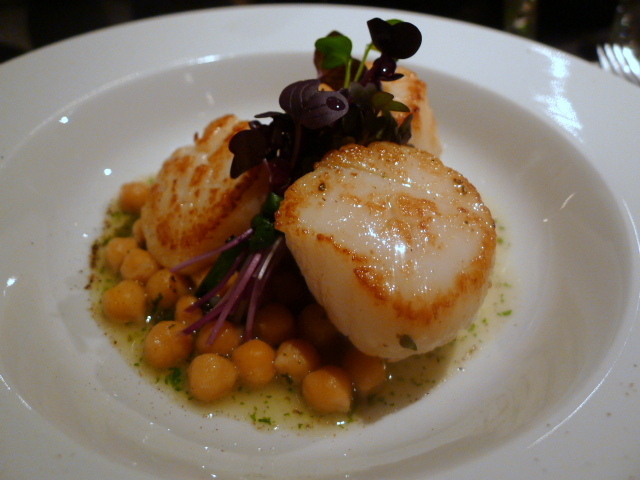 The gentle flavour of the accompanying Spello creamed chickpeas and aromatic bruschetta paired well with the scallops. A simple, yet classy dish. The selection of breads was excellent. 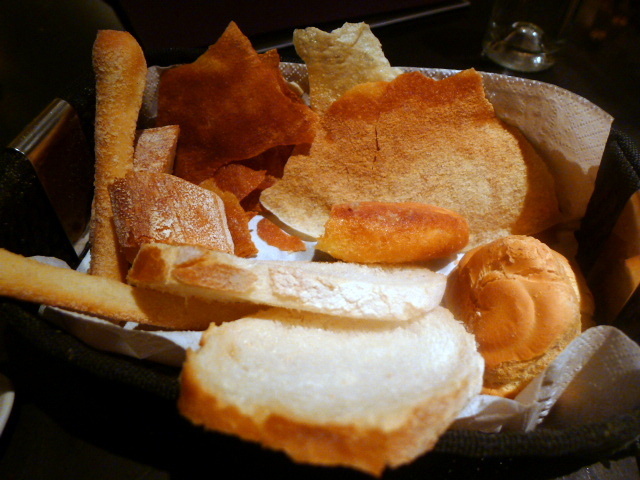 All were well made, particularly the extremely light and crispy carasau (flatbread). A dessert of deconstructed tiramisù with torrone (£7.50) proved interesting. 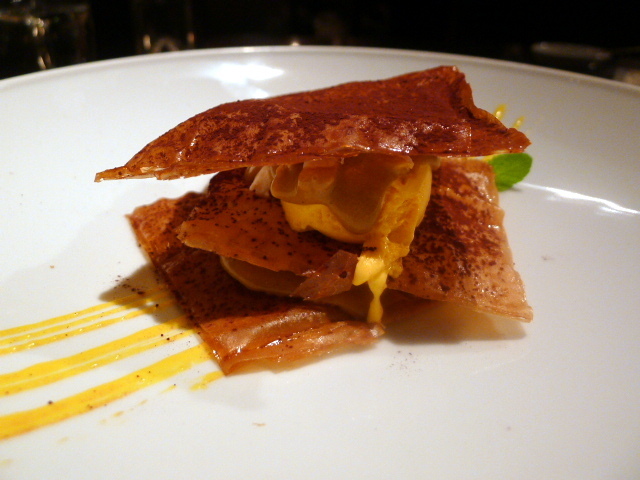 Marscapone ice cream with torrone (nougat) was sandwiched in between layers of fried filo pastry. The crispy pastry was great, but the ice cream was a little too sweet, and the taste of the dessert bore little resemblance to that of a tiramisu. We finished with a Ca’ D’ Gal, Moscato D’Asti – Piemonte, 2010 (£7) which was bubbly, light and not too sweet. A delicious way to finish. The food was refined, accomplished and beautifully balanced. The produce used was excellent, and the cooking exuded confidence and care. With the exception of the tiramisu, there were few fanciful gimmicks to this meal, which explains why the food is more ‘everyday’ type food. It is not intended to be Michelin dining but great cooking. The service was attentive although the staff were difficult to understand at times. Nevertheless, at this price bracket and for this quality of cooking, Cotidie is a restaurant that is definitely worth visiting. Prices: £38 – £53 for three courses. The six-course tasting menu is £65. Excludes drinks and service.